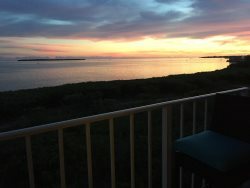 Upgraded 2 bed, 2 bath oceanfront condo with amazing sunrises and ocean views! Top Floor 2 bedroom 2 bath...Ocean view! All new, fully renovated, pictures are up-to-date! We are excited to present to you this pristine and upgraded 2 bedroom, 2 bath condo in Ocean Pointe Suites Resort! Enjoy an ocean view and an easy walk to the beach, marina, recently renovated pool and hot tub as well as the restaurant from this condo's sought-after location in building 5. This is not your average vacation accommodation. The quality furnishings and upgraded decor gives the feeling of home...but better! Sleep comfortably in the king bed in the master bedroom that has a flat screen TV, private balcony and an updated, en-suite bath with a large, tiled shower with frameless glass doors and easy step-in access. The guest bedroom has twin beds and connected access to the guest bath with a tub/shower combination, beautiful glass tiled floor and marble-topped vanity. The kitchen is fully equipped and is open to the dining and living area so the cook doesn't miss a thing! Grab your swimming suits, sun-hats and join us at 5308 Ocean Pointe Suites beach here in the fabulous Florida Keys! Everyone I talked to was very friendly and helpful. We would rent through Barefeet again, so I would definitely recommend Barefeet rentals to our family and friends. We didn't have any problems. All communication with Barefeet worked really well from start to finish. We really enjoyed the condo and the property. Our boys LOVED fishing in the marina area. Our daughter loved the pool. We used the tennis courts a few times. Some quirks - being located right across from the trash shoot was not wonderful. We were woken up several times by loud people in the hallway. One night around 2am someone was throwing glass bottles down the trash shoot. The front door lets lots of noise in, since it isn't a solid door (plexiglass window). Kitchen was well stocked. I was thankful that the floors were clean! We remove our shoes at the front door always when at home or away from home. It is nice when our white socks stay white while on vacation! Everything else was very clean. No issues at all. Overall a really nice place. We could see coming back. From sunrise to sunset you can enjoy the many activities Ocean Pointe has to offer or just relax in your oceanfront condo and surround yourself with our tranquil environment of sixty acres of tropical elegance in the Fabulous Florida Keys! Your vacation begins the moment you drive through our gatehouse entrance into our beautifully landscaped tropical grounds and enter your suite. Your accommodations will include a whirlpool tub in the master bath, a fully equipped kitchen, and a private balcony. After enjoying a convenient breakfast in our cozy waterfront cafe, use our free lighted tennis facilities, swim in our huge heated pool, get some sun on our private beach or just take a walk along our private boardwalk and marina. The marina, with a boat ramp, capable of handling craft up to 28 ft, attracts many boaters to Ocean Pointe. Fine restaurants and shopping are just minutes away, along with boating, fishing, snorkeling, diving, Everglades eco-tours, glass bottom boat reef trips, para-sailing, wave runners and swimming with the dolphins. Everything you could want for the perfect vacation!